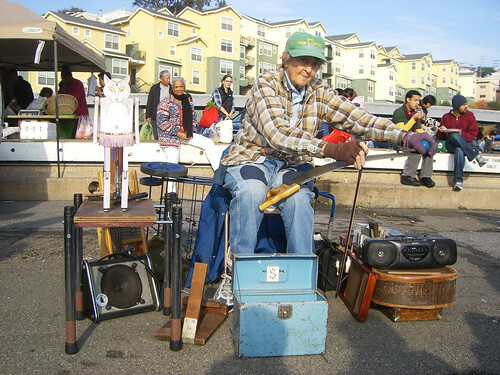 Jackie Jones has been a Saturday fixture at San Francisco’s Alemany Farmer’s Market for more than a decade, entertaining foodies — and their kids — with her charming musical act. Her instruments include a washboard guitar, a hand saw she plays like a fiddle, and a battered boombox she uses to DJ backing beats on well-worn cassette tapes. Best of all, however, is Jackie’s feline sidekick — a dancing wooden controlled by a foot pedal. Since she arrived in San Francisco in March 1952 from New Orleans Jones has played music continuously in dance bands bar bands Latin bands Russian bands stage bands gay bands Hawaiian bands country bands and even with the legendary Cockettes. She’s played at county fairs and strip shows and everywhere in between.